Irene Breen, a current Queen’s University MBA student and a BSc Architecture (2002) graduate, has seen off competition from over 2,000 entries from throughout the UK to win the Santander Universities Entrepreneurship Award for her fledgling business, BellaMoon. Ms Breen, pictured above (left) with Nathan Bostock, CEO Santander UK, was in London (05 October) to collect the prize which includes £20,000 of equity-free seed funding, mentoring from one of the judges at the national final, support from Talent Cupboard and a fully funded intern. Launched in 2011 the Santander Universities Entrepreneurship Awards have grown to be the UKs largest student and graduate business pitching competition offering important support to budding entrepreneurs. So far, more than £260,000 has been awarded to graduate start-ups and small businesses through the initiative. Irene’s winning business BellaMoon, was in the ‘Pre-revenue’ category, defined as a ‘business focusing on ideation, discovery and business validation with minimal sales generated if any’. BellaMoon is currently going through user testing at University of Durham Infant Sleep lab. It is a unique multi-functional baby breast-feeding and co-sleeping bed, pregnancy pillow and baby dock, which Irene is planning to bring to market. Speaking to Queen's shortly after collecting her award Irene said: “It was a huge honour and privilege to represent Queen’s University Belfast and Northern Ireland at these prestigious national awards with my new business BellaMoon. 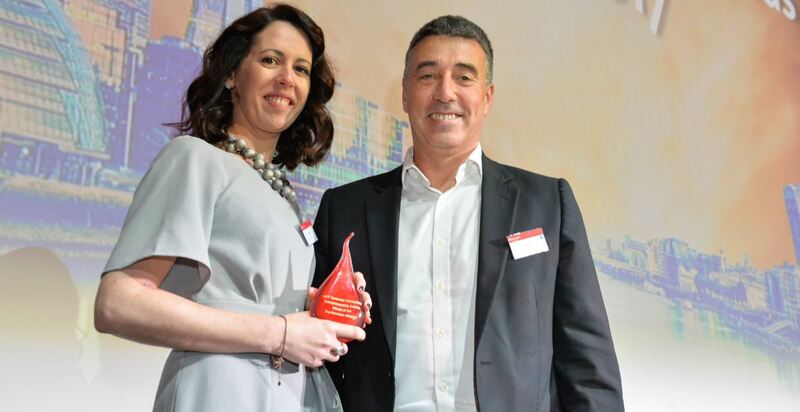 Winning the Santander Universities Entrepreneurship accolade – which was beyond my wildest dreams – is just fantastic! I’d like to thank Kat Maguire from QUB Enterprise for all her support and guidance, and for helping me prepare my final pitch in recent weeks and days. “In addition to the equity-free and business support prize fund I am really looking forward to working with my new business mentor and new intern in the coming months as I prepare to launch BellaMoon on the market. “The Santander Universities Entrepreneurship award certainly gives huge credibility to my business and will hopefully enable me to take BellaMoon to the next level," she added. Colm Quinn, Queen's University Relationship Branch Manager, Santander Universities UK based in Queen’s Students’ Union added: “Queen’s University has performed extremely well in this competition, with finalists in each of the last 3 years. BellaMoon has, however, exceeded all our expectations! “Irene worked incredibly hard and throughout the year built relationships with many of her fellow competitors. And she has started working with other businesses and partners. To get to the grand final Irene had first to submit a business model canvas and a short video to get shortlisted to the top 30 regional finalists. She then had to travel to Northumbria University to compete against 10 others for a top 2 place in the region before taking part in the London national final where she faced stiff competition from the top 6 (the best 2 out of the three Santander UK regions) challengers. The judging criteria included business mission, purpose and overview, an understanding of potential customers, identification and mitigation of risks and growth strategy. Earlier this year Irene won the ‘Best Emerging Business’ at the Enterprise Ireland Student Entrepreneur Awards. She has also secured funding from Techstart NI and has recently become an Invest NI client. Queen’s Enterprise SU has assisted Irene by providing mentoring and support, including from entrepreneur in residence, Helen Keys. The student business support initiative also facilitated meetings to help Irene improve her pitch, enabled meetings with Invest NI and others and provided budget for her to travel to competitions and external consultancy sessions. Kat Maguire from Enterprise SU said: “Congratulations to Irene Breen, who fought off so many excellent entries to win the Santander Award in London this week.